"The Windows Live Team is currently working on Wave 4, that is, the 2010 versions of Windows Live. This includes both web services and Windows Live Essentials. Let’s take a closer look at Windows Live Messenger 2010 Milestone 1, as recently discovered by the technology news site Neowin. We can expect the final result to look somewhat different, but what we’re going to look at gives you an idea what the focus is on in the 2010 version. First of all, we notice that the window is now wider and separated into two columns. 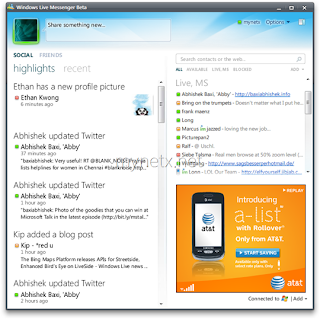 The left column contains social news and activity streams, including the What’s New Feed, while the right-hand section includes your Windows Live Messenger contact list and an advertisement area. This window split can be reverted using the button on the top right edge..."